Livraison conforme aux attentes, le produit est exactement le même que l’ancie Qui était défectueux. Amazing beast of a battery. Great replacement for my Harley. Same factory battery as Harley's original. Perfect fit as replacement for original '98 Road King Classic battery. Good battery, if a bit expensive. Plenty of cranking power. Last one I had worked for 7 years. Great service from Tayna. Ordered at 4pm, dispatched at 4:10pm and in my hands the following morning. Took several days to arrive :-( the other batteries I have ordered from Tanya have arrived next day. It fits a Moto Guzzi V35, but is a squeeze. Good quality battery. Delivery by DPD was excellent. It works, although clearly not designed for the 1977 RS as the bolts had to have extensions fitted to them. It is too tall!!! Good battery...fits well, good contacts and posts, cranks the engine well for starting -important for a big twin, 25-year-old classic! All good! Great battery / packs a real punch to my v twin !! 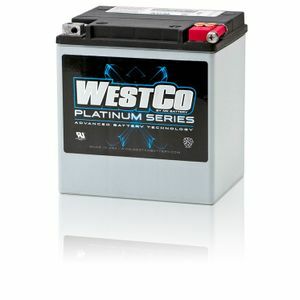 Best battery I have ever used on an R100. Never lacking in chuff even when very cold. Only make of battery I feel confident with for this bike. Lasts well too. Excellent service. Battery fitted straight into my bike. Superb powerful reliable. The only battery I will fit to a 1000cc airhead. Very quick delivery! Purchased Friday 3 o'clock delivered 12 o'clock Saturday very happy with the service, would recommend.